Living a Fit and Full Life: Create a Safe Home for Your Child with Dreambaby Child Safety Products! Create a Safe Home for Your Child with Dreambaby Child Safety Products! 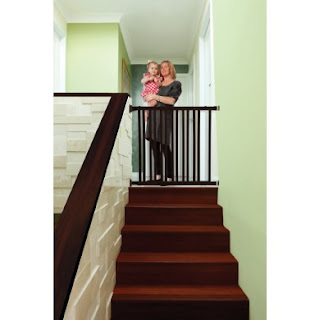 Dreambaby® Nelson Wood Swing Gro-Gate® is the ideal childproofing tool to protect children from danger and injury around the home. It's hardware mounted, easily adjustable and conveniently swings open and closed for easy pass-through with a simple one-handed operation. Fits openings 76–122cm (30–48in) wide and is 81cm (32in) tall. For even wider distances, up to 220cm (86.5in) two gates can be joined together. Creating a safe home for your child is a breeze with Dreambaby child safety products! Dreambaby Home Safety Value Pack comes with just about everything you need to create a safe home environment for your baby. My 10 month old is really getting around now so I've been busy child proofing my home. There's a few really basic things that anyone with kids needs as far as child proofing your home goes. Dreambaby Home Safety Value Pack helped my child proof my home in no time. I also have stairs in my home so a child safety gate is a must. Dreambaby's Nelson Wood Swing Gro-Gate in espresso not only looks great but it works wonderfully. I installed it at the bottom of the stairs and absolutely love that it tied in my my homes style. It's also extremely easy to use which is a major plus since I have four kids and it definitely gets used throughout the day. Another huge plus was how easy it was to install. Dreambaby's Nelson Wood Swing Gro-Gate is hardware mounted with means I dont have to remove it every time I need to use the stairs. It simply swings open and close. Perfect for using on the busy stairs in my home. Dreambaby's Nelson Wood Swing Gro-Gate is extremely sturdy and has stood up well to my sons pulling and bracing himself on it while he's learning to walk. I love these Dreambaby products and highly recommend them!